Consider this: the average traffic jam in Mumbai will be of 5 hours by 2030 as there will be three times as many vehicles as there are today in the city! That is just one of the many terrifying scenarios that Mumbaikars can look forward to, provided urgent steps are taken to address the city's problems of physical infrastructure, housing, governance, growth, healthcare, education, and security. At 'Megamorphosis: Resurgence of Mumbai', a two-day conference organised by Bombay First from Tuesday, a host of ideas aimed at making Mumbai a world-class city were floated. Ideas central, and indeed common, to every speaker's presentation were that Mumbai requires a complete transformation in thinking, mindset, attitude, behaviour of its people, governance, and the role of private sector in making it a city of dreams as envisioned by its founders and citizens. Shirish Sankhe, director at the Mumbai office of McKinsey & Company, made a standout presentation on creating inclusive and liveable cities that painted a scary picture of Mumbai's vexed issues, but offered viable solutions. 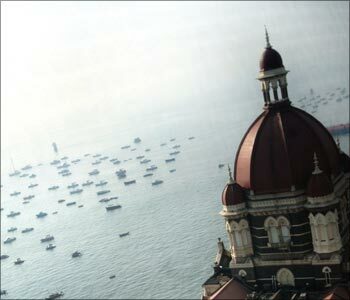 Image: The domes of the Taj Mahal hotel are seen in front of the Arabian Sea in Mumbai. 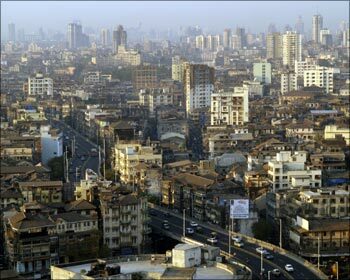 The McKinsey study said that Mumbai will be the world's most populous city by 2030. By 2030, between 40 per cent and 50 per cent of India's population will live in the cities. The five largest states, including Maharashtra, will become more than 50 per cent urbanised by 2030. Cities alone will drive 70 per cent of India's GDP and 85 per cent of tax revenues by 2030. The GDP of some of India's largest regions will be more than the GDP of many countries today. The Mumbai Metropolitan Region (MMR) will be the most populous area in India with also the highest GDP amongst all Indian cities. By one account, more than 50 per cent of Mumbai's population resides in slums. Given that the population of the city is close to 19 million, more people live in Mumbai's slums than in entire Switzerland. Image: An aerial view of Mumbai city. More than a quarter of India's rupee-billionaires live here, but abject poverty and creaky infrastructure remain a sharp counterpoint to its gleam. And although Mumbai continues to be the vibrant, pulsating financial hub of India and is growing at a dizzying pace, its cup of woes is overflowing. However, these daunting challenges also offer a unique set of opportunities to Mumbai, but prompt action is needed even as the pendulum swings inexorably. 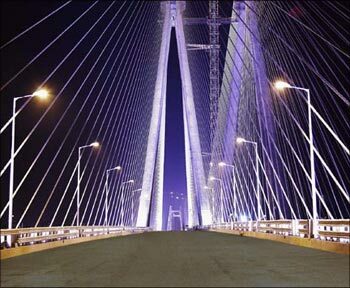 Image: The bandra-Worli sea link in Mumbai. To meet these demands, Mumbai will require a mountain of money. The current rate of investment flow into Mumbai, although healthy, will be insufficient and there will be significant backlogs across sectors, said McKinsey's Sankhe. But the good news, he added, is that these challenges can be overcome. Sankhe said that bridging the funding gap would be mostly possible through MMR's own resources, and thus the most important thing would be for the administration to focus on implementing projects that can make Mumbai liveable. The McKinsey study, said Sankhe, suggested that the Maharashtra government must implement five iconic projects in the coming five years to give concrete shape to Mumbai's dream of becoming a world class city. 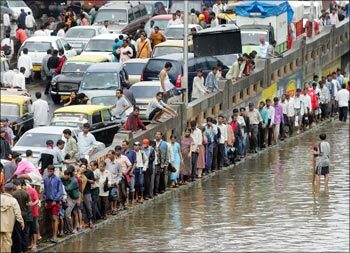 Image: People walk home as traffic after came to a standstill following heavy rains on July 26, 2005, in Mumbai. 1. Early completion of all the 13 corridors of metro rail and monorail should be completed soon. The city's primary mass transit systems need to be supplemented by feeders, interchanges and parking lots to ensure connectivity and convenience of use, so that public transport is attractive. 2. The development of a whole new world-class township with superlative facilities and services in the next five years. 3. Quick completion of the Ring Road, which is the next-generation roads linking the city's various suburbs with the larger Mumbai metropolitan region. 4. Rapid completion of the Mumbai Trans Harbour Link, connecting Sewri to Nhava Shewa. 5. Creation of one million affordable houses in MMR. Sankhe said that these projects need not necessarily be fully completed within five years, but it is imperative that work begins on this forthwith so that in the next five years they are in an advanced state of completion. Image: How Mumbai can be a world-class city. To enable the smooth implementation of these iconic projects, Sankhe suggested 7 policies that the government should follow in the areas of funding, planning, governance, etc. 1. There should be a policy to monetize land, on the funding side. 2. 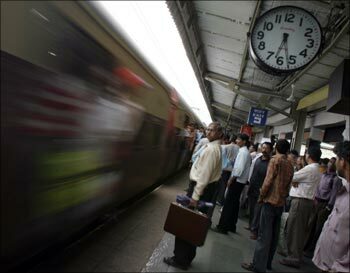 Mumbai urgently needs a new 2030 master plan for structured and timely execution of projects. 3. Implementation of the 74th amendment to the Indian Constitution. The 74th Amendment Act provisions allow for strengthening the capability of municipal governments. The main areas to which attention has been given are: constitution of three types of municipalities; regular and fair conduct of municipal elections; representation of weaker sections and women in municipal governments through reservation of seats; devolution of greater powers and functions to municipalities; constitution of state finance commissions; and constitution of wards committees, metropolitan planning committees and district planning committees. 4. Implementation of an empowered Mayor-Commissioner structure for effective governance. 5. Creation of corporatised agencies in urban/local bodies. 6. Creation of e a monitoring body at the state level to benchmark Urban Local Bodies problems and settle disputes. 7. Offering affordable housing, like in the Rajiv Awas Yojana which was announced in the Union Budget. The Rajiv Awas Yojana aims at promoting a slum-free India in five years and focusses on according property rights to slum dwellers, in an effort to promote a slum-free India in five years. 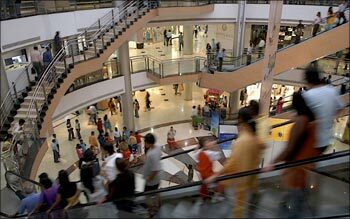 Image: People inside a shopping mall in Mumbai. Sankhe said that to implement these policies there is an urgent need to create a 'war room to de-bottleneck the top 50 projects in Mumbai and Maharashtra on a weekly basis' where the chief minister can take informed and quick decisions. Mumbai offers a great opportunity to develop infrastructure, but urban planners, along with the government, the local bodies, citizens' groups and the private sector need to get their act together to provide adequate, integrated, and timely infrastructure that can meet the needs of a vibrant Mumbai. For Mumbai to become the city of the future, all this and more needs to be done, lest the megapolis continues to teeter on the brink of collapse under the pressure of its rising population, inadequate infrastructure, lack of coordination amongst its governing bodies, worsening climate conditions, ineffective security systems, etc. Also present at the occasion were Narinder Nayar, chairman of Bombay First, and managing director, Concast India Ltd; Ashank Desai, founder and former chairman of IT player Mastek Ltd; Junaid Ahmed, World Bank sector manager for Social Development in the South Asia region; Ratnakar Gaikwad, Metropolitan Commissioner, Mumbai Metropolitan Region Development Authority (MMRDA); Richard Barnes, Deputy Mayor of London; among others. 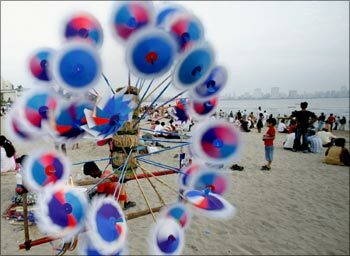 Image: People relax on a beach in Mumbai.